What is a promise ring and who will wear?A promise ring is given to someone to signify your commitment to the one you love. Promise ring could be either a sign of love and friendship so it is important to explain what does it mean when you give. If your fiancee gives you a promise ring it is like a pre engagement ring. I remember my fiance gave a promise ring during christmas. 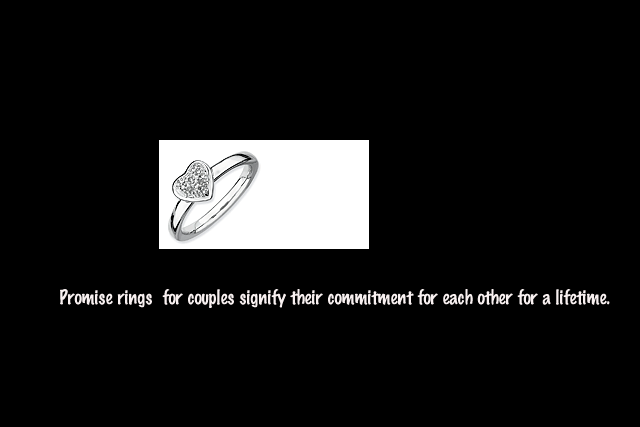 Some wear a promise rings for couples which rings signify their commitment for each other for a lifetime. Both couples have to wear it but of course you have also to show the true meaning of your commitment to the one you love. You don't need to buy an expensive ring it is how you much you can afford and don't over extend yourself for something. Today, I am wearing a promise ring on the left hand on the middle finger.The ring I am wearing is so simple but our friends have personalized ring.